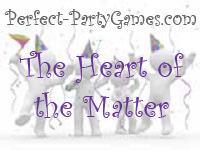 Summary: The Heart of the Matter is a word game where you use clues to discover the state of heart. Pass out the game sheets along with a pencil or pen. Allow 5 minutes for the players to correctly guess the state of heart by using the clues on the worksheet.